The easiest way to connect to friends playing Starbound is through your Steam friend list. Simply right click a player's name in your friends list and select 'Join Game'. This will connect you to their in-progress game of Starbound and you'll appear in their universe. There you'll have everything on your ship with you, but anything on planets will appear as it does in their game, not yours. 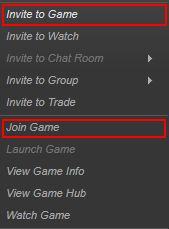 Alternatively you can select 'Invite to game' which will invite them to join your game with whatever character they're playing with. You must be logged into the game with a character for this option to be available. After selecting to open Starbound in Steam the option comes up to launch a dedicated server. This will launch starbound_server.exe which hosts a server from your machine. This allows players to connect to your machine to play Starbound, even if the game is closed (provided the server software is still running). Locally, you should still be able to connect to your server using the IP 127.0.0.1 (Local Loopback) in the Starbound client, however your friends won't. Server Address: Enter the IP or DNS name you wish to connect to. Once you're in-game, you and your friends will be on different ships and or planets. To CREATE a party, once the friends have joined your game, press the ( + ) icon in the upper right, below your character portrait, and put in your friend('s/s') character nickname. (If you do not know the friend's nickname, check the chat for it, displayed such as: "(Name) Has Connected"), and click on invite. To JOIN a party, once the owner of the party has sent you an invitation, simply click accept, or deny. In a few seconds, you should see the owner's Character Picture, as well as any other Player's Characters pictures that are already in the party. Note: Once you're in a party with someone, you can warp to their ship by clicking on their portrait. By editing the file 'starbound.config' in the giraffe_storage directory, players can adjust the settings for the server they're hosting. This method allows players to configure server passwords, ports, default game settings and much more by adjusting values. windowTitle Game program window title "Starbound - Beta"
title.connectionString IP address of the last server connection ""